1981 Kazakh Polytechnic Institute named after V.I. Lenin. Specialty: geological survey, prospecting and exploration of mineral deposits. Degree: MS of Geological and Mineralogical Sciences, 2002. Academic title: Corresponding Member of the International Academy of Mineral Resources, Academy of Mineral Resources of the Republic of Kazakhstan. 05.11.1981-14.06.1996: District, senior, chief geologist of the Zyryanovskaya GRE; Exploration, prospecting and appraisal work, preliminary and detailed exploration of polymetallic, gold, coal, OPI, groundwater deposits. The author of the report with calculation of reserves of coal-shale deposit Kendyrlik, one of the authors of the report with calculation of reserves of the Maleevsky deposit, etc. 17.06.1996-09.03.1998: Deputy Chief, Head of the Technical Department "Vostkaznedra";Supervised geological study of the region, monitoring and control of subsoil use. 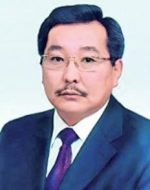 09.03.1998-01.01.1999: Deputy Chairman, Chairman of the State Commission for Reserves of Mineral Resources of the Republic of Kazakhstan; He created a system of state expertise of subsoil in the new economic conditions, reviewed and approved the reserves of deposits of all types of minerals, including giant ones - Tengiz, Royal, Karachaganak. 01.01.1999-09.01.2013: Chairman of the Committee for Geology and Subsoil Protection, First Deputy Chairman of the Committee for Geology and Subsoil Protection, Deputy Chairman of the Committee for Geology and Subsoil Use; He participated in the creation of a strategy for the development of the mineral and raw materials complex and the development of the geological branch of the Republic of Kazakhstan.The developer of the branch program for the development of the resource base of the RK mineral and raw materials complex; participant in the development of all revisions of the Law "On Subsoil and Subsoil Use", programs for monitoring and control of subsoil use, state geological study of subsurface resources. Permanent member of interdepartmental commissions, colleges of ministries, expert councils, workinggroups, CKDR. 01.02.2014 and up to the present Consultant LLP "Centroconsulting"; State awards, honorary titles: Medal "10 Years of Independence of Kazakhstan", Order of the "Silver Eagle" of the Russian Academy of Natural Sciences, Laureate of the First Prize of K. Satpayev, laureate of the Sh. Esenov Prize, Honorary Scout of the RK, Pioneer of deposits of the RK, Certificate of Honor.